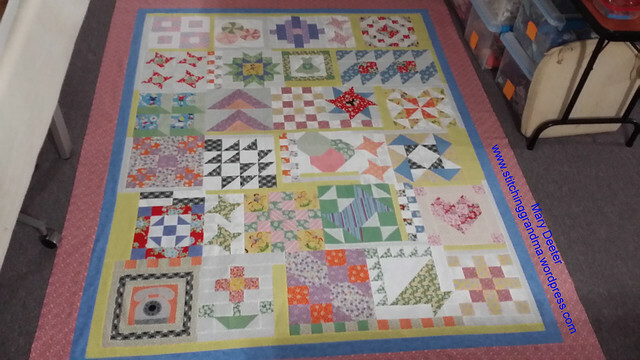 This entry was posted in Random acts of Quilting and other projects and tagged From My Carolina Home, Grandma's Kitchen, hobby, Home, Pat Sloan, sewing room, sewing time. Bookmark the permalink. Hey you didn’t mention anything about feeding you! Seriously, I don’t know which I’m more excited about, getting my new Gammill delivered and set up tomorrow or seeing you in a few weeks. We’re going to have so much fun. And don’t forget, we DO live in wine country. 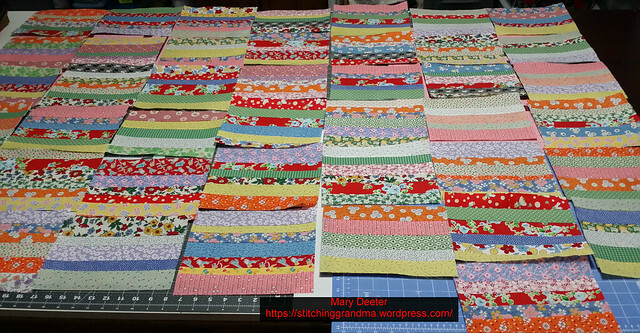 I just did a scrappy strip border au naturel (no foundation) on a similar-sized quilt. It turned out a lot more accurate and trouble-free than I thought it would. I’m sure if I tried it again, it would be no end of nightmares, so I’ll have to file away your method in my memory banks. PS I’m in Maryland just south of Baltimore. We’ve heardeverything from 2-3 to trace to 1, to 5-12 (the latest) of snow for our area. Good thing I have two quilt tops in the works. Hi Jo, thanks for popping in and taking time to comment. I picked up the phone book pages trick from Bonnie Hunter’s method. It works great to use some type of foundation. Her book, String Fling, has lots of tips too. So far, just rain, but who knows what the next day will bring in Sussex County Delaware! I think the weather folks are covering all the bases! 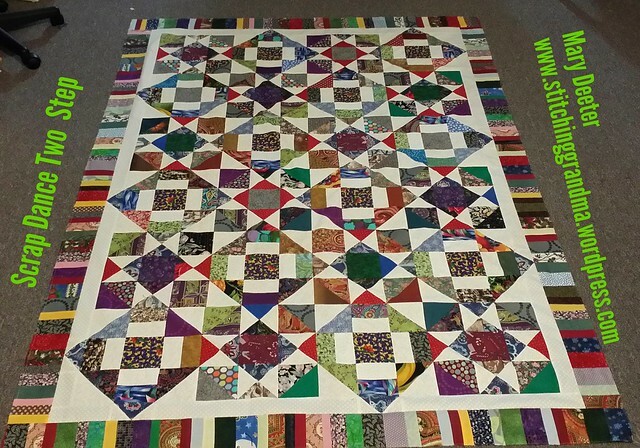 Snow or rain, either make for fine quilting days! I simply love your Grandma’s quilt. The blocks are amazing. Looking forward to meeting you in April. Thanks Mona! It was a FUN project to work on, and there were some opportunities to learn new skills. I don’t have any family members I can share my quilting with, but I have several ladies I enjoy sharing with. Your quilts are beautiful. Thank you Judy for popping in. The friends are the “next best thing ” ! 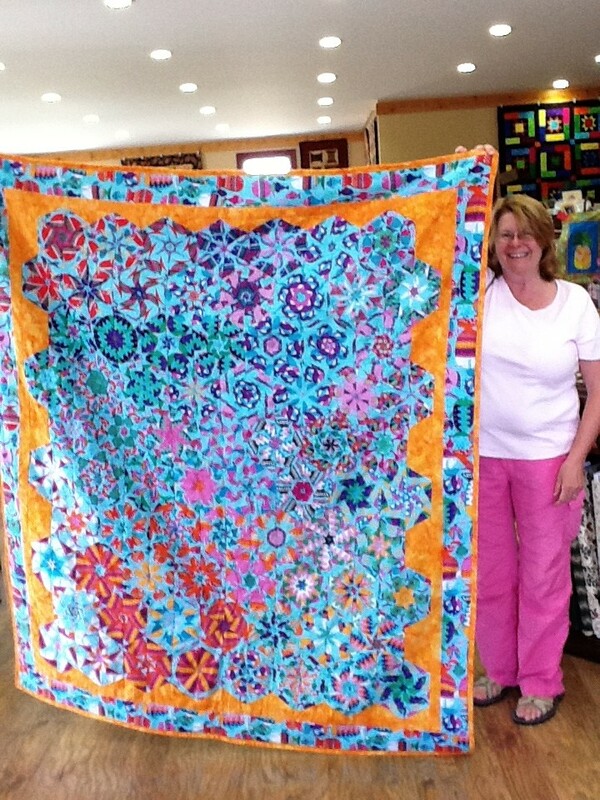 I’m blessed to have made so many friends in the quilting world. Thanks for taking the time to read and comment. The scrappy border really is my favorite part of the quilt. Can’t beat scrappy! 😊 You are very welcome!